While all three of my dogs are "northern breed mixes" they have three different fur types. Caring for the coat of any dog can be a challenge, though it doesn't have to be. Coat health starts within, and Isle of Dogs Nourish products are a beneficial addition. This post is sponsored by Isle of Dogs. All thoughts are my own. Diet. The best thing I do for my dogs' coats is feeding them a raw diet. I personally feel that unnecessary ingredients, fillers, and poor quality ingredients will take their toll on a dog's coat by making it either too dry or too oily, "dirty" feeling, and even increase the rate at which they shed. Proper nutrition can contribute to a healthy coat, be it in the form of a raw diet, a balanced homemade cooked diet, or high quality kibble or canned food. 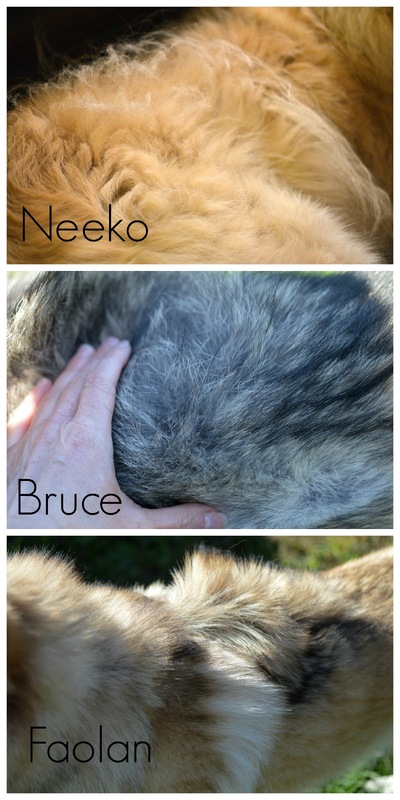 Neeko has a very woolly coat, with long guard hairs, and the thickest undercoat I've ever encountered on a dog. Bruce has what I consider a typical northern breed coat, and Faolan's is a combination of northern breed and GSD. Coat care is not one size fits all, especially in my house. Bathing. I am not a fan of or believer in over bathing dogs. It can strip the natural oils and dry out the skin, contributing to itchiness and fur loss. If a dog feels oily or is stinky without good reason, the problem could be due to diet or genetics. Some fur types are prone to holding odor more than others. My boys haven't had baths in five years, yet both are soft, and neither stink or feel dirty. Neeko gets 4-5 baths per year, usually all in the spring and fall, due to the changes in her coat during these time periods. 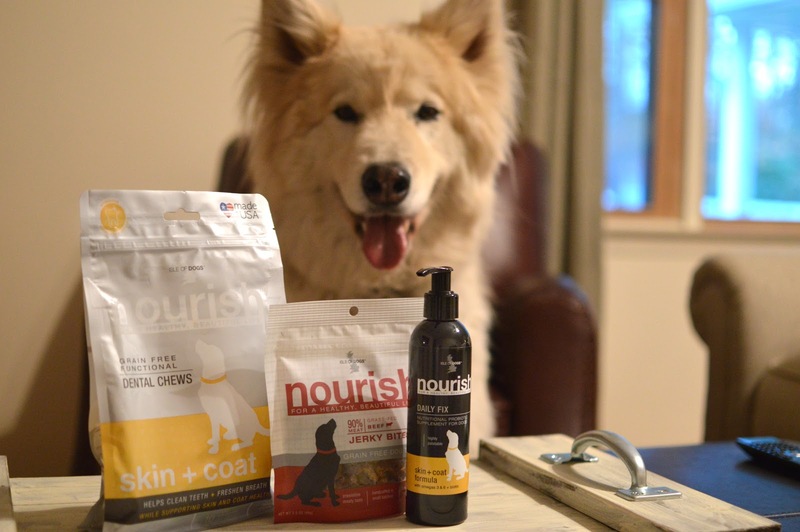 Nourish Grain Free Functional Dental Chews contain beneficial dental benefits on the outside, and beneficial skin and coat ingredients on the inside. Bruce LOVES dental chews. However, most contain yeast, which he is highly allergic to. Isle of Dogs Nourish Dental Treats do not! What they do contain is kelp, chicken liver, parsley, and turmeric, amongst other ingredients I am comfortable offering to my dogs. Daily Fix Nutritional Probiotic Supplement - Skin + Coat Formula contains fish oil, vitamin E, and biotin for coat health, and probiotics for GI health. My dogs find the taste irresistible, and it is easy to dose in a clean/drip free pump. Omega fatty acids are well-known to benefit a dog's coat, and also overall health. This is a convenient way to offer them. As I mentioned above, my dogs are NOT fans of being brushed. They tolerate it at best. We have lengthy brushing sessions in the spring when they are shedding, and shorter brushing sessions throughout the rest of the year. One way I get them to cooperate with and tolerate the brushing sessions is by offering them yummy treats during the brushing sessions. Nourish Grain Free Jerky Bites contain no wheat, corn, potatoes or rice. They are 90% beef or lamb, and contain Green-lipped mussels. 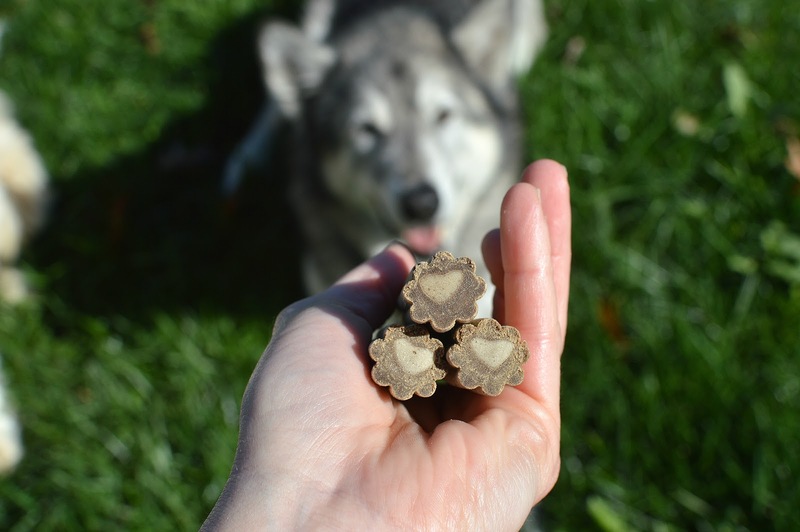 These small treats contain limited ingredients, are easy to pass out, and my dogs love them. They definitely make the brushing sessions quicker for all of us. Feed the highest quality food you can, brush your dogs regularly, bathe them when needed, and supplement as necessary. How do you care for your dogs' coats? Grrreat post! I have Isle Of Dogs finishing spray for when I go to dog shows. It makes my coat nice and shiny! Oh cool, I really like that their dental treats are made of kelp, chicken liver, parsley, and turmeric. Most people misunderstand rats. The idea of rats as pets seems to be self-contradictory to them. However, more people than commonly thought own a pet rat, or even several pet rats - often nicknamed fancy rats. If you have arrived here you may own one or some already, or thinking of owning one, or simply want to know more about the fancy rat. Whichever is true, Here you will learn some tips about attending to pet rat health, which pet rat cages are best and how they should be prepared for your cat carrier rat, and general tips about pet rat care and pet rat training.